Funny how there are so many memories associated with every season. Winter for me brings back all my favorite memories, especially those related to food. Those last few months of the year, of pleasantly cold days in Pune have etched a special place in my heart. I remember walking with Mom to buy seasonal vegetables. Gosh! there were so many winter special veggies.. Carrots, corn and sweet peas. Mom would stock up on sweet peas whenever the price dwindled down to a mere 2 digit a kilo. And when that happened, I remember there was collective effort in the family to sort and clean up the sweet peas and store them safely into the fridge. Sweet peas also referred to as Matar, would then be incorporated in all food items- breakfast, sabzi, rice, snacks and every possible way. One of my favorite form was to eat Matar Karanji. 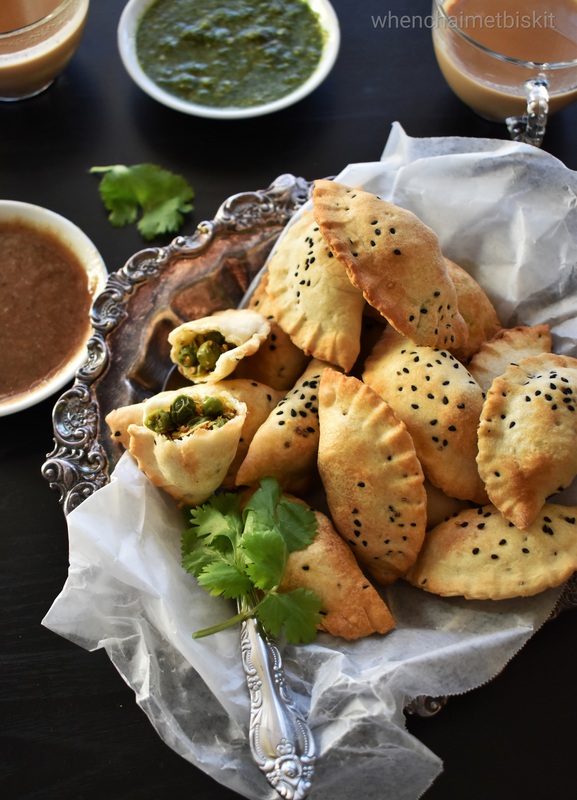 Mostly on lazy sunday afternoons, Mom would make deep fried Matar Karanji (small handpies). I would insist her to make it in the morning and my food would be Matar Karanji all day. Eventually, I moved away from this deep fride version, more because I started putting on a lot of weight. I would resist eating it until a time came when I hated it. Fast forward to the last few years, I met my husband who is an ardent Matar Karanji lover. The very first thing he made me do after we got married was make Matar Karanji. I remember making almost a kilo of Karanjis for my husband’s office potluck. And so, the Matar Karanji fever gripped me again. Only this time, I am the one making and he’s the one eating. 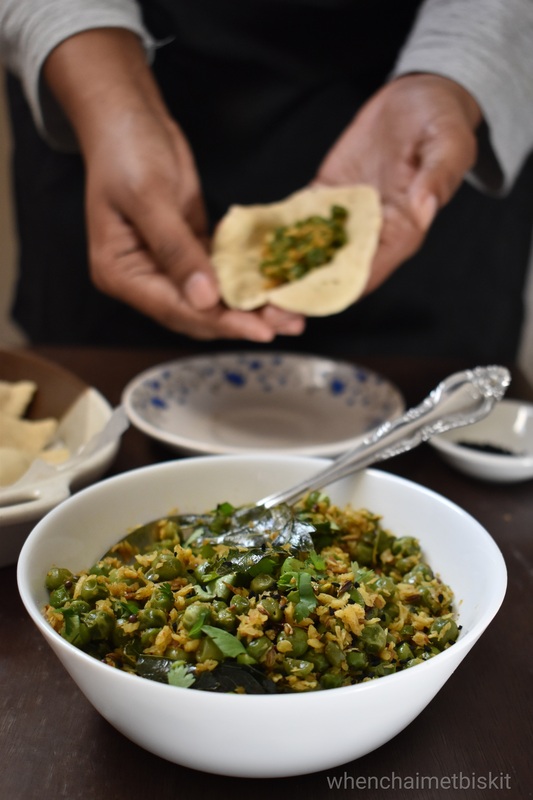 From the last few years, it is sort of a ritual to make Matar Karanji at this time of the year and devouring it with all sorts of chutneys and finishing off with some bubbling Tea on cold weekends. Now, I have slowly tried to move this favorite deep fried snack into not so fried snack with the help of baking them in the oven or using my recently purchased air fryer. 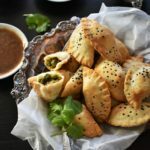 Matar Karanji is easy to make and absolutely delicious to taste and most of the ingredients are easily available in the pantry except for the fresh green pearls of sweet peas. 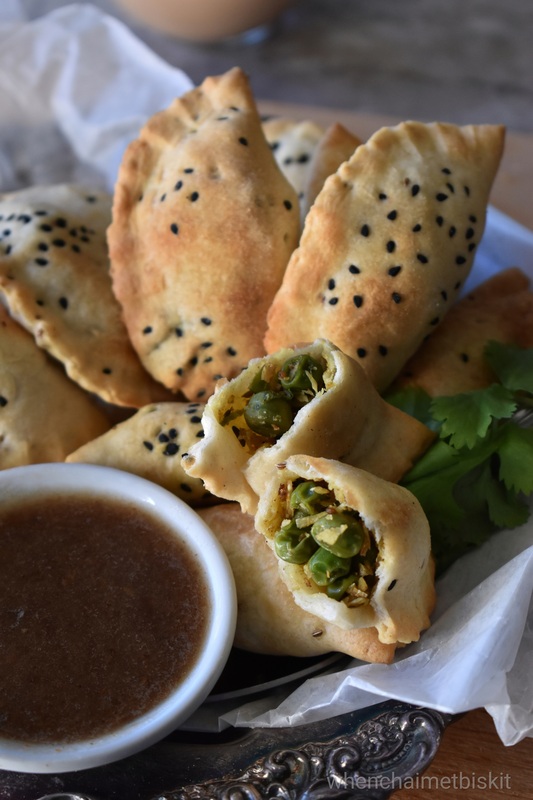 Matar Karanji is deep fried snack made with flaky crust and savory filling of sweet peas and fresh coconut. Only this time I have used my Air fryer to make them less oily yet tasty. In a mixing bowl, add together flour, salt, carom seeds, cumin seeds, baking soda and hot oil. Mix the oil into the flour well to make it flaky. Once all the oil is properly mixed, start kneading the dough with it. Add water as and when required. Do not add to much water. The dough should be tight. Once the dough is properly kneaded, let it rest for 1 hour. Meanwhile, in a small saucepan, heat oil on a medium flame. Once the oil heats, add mustard and cumin seeds and let it splutter. Into this oil, add curry leaves (optional), asafoetida and chilies. Then add sweet peas and fresh coconut. To this add, salt garam masala , chili powder and chaat masala. Mix everything well and adjust the taste of it as per your taste. I recommend making this stuffing slightly spicy. Roll a round dough of ¼ inch thickness. Sprinkle some Nigella seeds while rolling the dough. Into this round dough, add the stuffing and conceal the ends properly. I have used an empanada mould to shape the Karanji. Place these Karanji into a covered bowl. Preheat the air fryer to 350F. Spray the air fryer filter with oil spray and place the Karanji to this air fryer. Set a timer of 10 mins and let them cook. Flip the Karanji and cook for 5 more mins. The Karanji should look slighly golden brown. Serve with tamarind chutney or sauce and enjoy! You can also bake these Karanji in the oven with similar settings. Do give this a try..